Skytopia : Tuning & Music Scales Theory - Why are there 12 notes in Equal temperament? Music scales & theory - The Basics. Which 12-note Tuning is correct? The big question - Is the equal tempered 12 tone scale really a compromise? Are more than 12 notes in music valid? Survey - submit your votes! music - and that they can be represented by numbers (or 'frequency'). Although there are few references on this page, my dissertation has almost 200 of them, so visit there if you need sources, quotes, and verification. usually spread smoothly in nice logarithmic steps from 1 to 2 (an octave). In other words, a pitch played an octave higher is twice as high in pitch as the original, and all 12 notes are spaced evenly inside this octave. However, note that I have highlighted the word 'usually'. What you may not know is that there are other ways of producing these notes/pitches (each approach different and giving near but not quite the same results) and that there is debate over which exact frequencies should be used for music! knows) is why there are 12 - full stop. Theory 1: Some have argued that the importance of the number 12 in music is thanks to the fact that the 12 equal tempered pitches approximate many simple ratios such as 4/3 or 5/4 very closely, but this surely isn't the full story, since other numbers (such as 19 notes to the octave) are quite good at this too. Also, you can use progressively ever more complex ratios - thus theoretically producing an infinite amount of possible pitches (most of which do not approximate the 12 golden notes very well at all). Finally, there are even 'rival' ratios for certain intervals such as the minor seventh (which could be 9/5, 16/9, or 7/4). Actually, pure ratios in general are ideal for timbre (the basis behind the harmonic series), but I don't think they should necessarily stretch to melody and chords. Theory 2: Others have argued how successive powers of 3 will 'complete' the scale after 12 iterations (the basis behind Pythagorean tuning), but this can't be the full story, since the twelfth iteration (312 or 3-12) - known infamously as the 'wolf' note - is a fraction over (or under) the octave. As a result, you could quite easily iterate further, and divide the octave nicely into 53 notes, 306 notes and beyond. Actually, even if 312 directly intersected the octave, this wouldn't be 100% proof, but it would be a good sign of 'mathematical evidence'. Theory 3: Alternatively, the 12-note scale could just be an arbitrary cultural construct, with no special reason to choose 12 above 5 or 50 note scales. This goes against common sense and a lot of scientific evidence, but one can't rule out the possibility. Theory 4: It's always a possibility that there may be no mathematical explanation why there are 12 notes. In the same way that science can't explain what it 'feels' like to see the color 'red', perhaps the notes of the scale are beyond mathematics, and reach into the qualia/metaphysical/spiritual realm (if it exists). 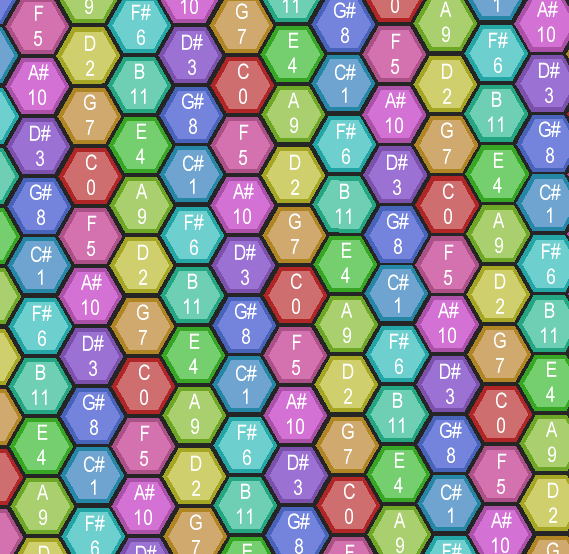 Theory 5: A neat honeycomb lattice appears to fit around the major/minor 12 note system. This seems an interesting coincidence until you realize a similar pattern can be achieved with the 16 note scale and beyond. 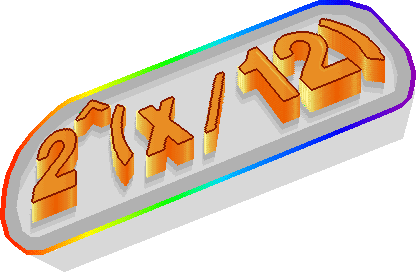 There still might be something unique about the 12-lattice though. Theory 6: Moving on to very speculative territory, you can surround a single sphere perfectly with 12 identically sized spheres - with each sphere perfectly touching its neighbouring spheres (this forms the points of the cuboctahedron, or the faces of its dual - the 'rhombic dodecahedron'). Twelve also has the exclusive property of being the Gravitational Symmetry Limit - another sphere arrangement based on the icosahedron (See this site for more information). It seems inherently dodgy to relate musical pitch to geometry, but it's a tiny possibility. While we're in geometrical territory, there also appears to be an interesting relation to the 4 dimensional 24-cell as explained here. Theory 7: As dodgy as the last one - a number of curious relationships exist between simple ratios and 12. For example, 37/213 * 5 is very close to the equal tempered perfect fourth (1.000000739402 off). Theory 8: If the last two are dodgy, then this ones takes the cake. According to Schoenberg (who promoted the idea of atonal 12-tone style music), there are 12 notes because if you take the sum of its digits: 1 and 2, they make 3. Wow, what a revelation. Assuming the number 3 is special in this context, now we just need to explain the magic behind the arbitrary 10-based decimal system :-) Seriously, with that sort of illogical reasoning, if someone was determined enough, you could find something 'special' about practically *any* number. Actually, there may be no single 'reason why' there are 12 notes, but instead, lots of 'little' coincidences - all of which might appear to hint at twelve. Either way, it would be easy to believe the number 12 is a universal, almost 'magic' number. Obviously, others still, could argue that music scales with more than 12 notes are indeed valid. In fact, there are a couple of reasons for tailoring music to use scales comprised of more than 12 notes (Just Intonation (JI) approximation and the 'unusual' style of Microtonal/Xenharmonic music). Later on in this article, I will explain all this - and why it is my opinion that such scales are mostly spurious - or at least not necessary (apart from for timbre purposes, as I'll also explain later). What exact 12 pitches make up the Chromatic scale? So, I've already said there's debate over which frequencies should be used for 12 notes of the chromatic scale. It turns out that these are obtained by using very different mathematical methods, but all of them with the goal of producing a scale that can be universally used for all music (or at the very least - a genre of music). Later, I'll give a few examples of these different methods and their resulting pitches. Suffice to say that most of these sound so very similar, but are subtly different by a fraction of a percent in pitch according to what method you choose. Part of the aim of this article is to shed some light on the what the best 'scale-building' method actually is. What exact pitch frequencies sound best for melodical purposes and together in harmony? I have researched the subject quite heavily (see my dissertation), and have spoken about it to many people. However, I'm still not 100% certain what pitches make up the 'perfect' scale, or even whether these notes should be fixed (or perhaps vary fractionally throughout a tune as it plays). There's also the possibility that each tuning has its 'advantages' and 'disadvantages' - in which case, the tuning would be appropriately tailored according to the content of the music. On the other hand, there's a remote chance that no tuning is a 'perfect fit' for a given tune - even if the pitches are dynamically altered in real-time by computer while the music's playing. Finally, we have to consider the case where tuning preference is observer dependent. In which case, one person/culture may hear in their 'mind's eye' something different to another person/culture, even given the same interval. If we take a look at the messy history of tuning, or the experimental studies, we'll find conflicting preferences and results all over the place. In fact, rarely will you find a topic so rich with complexity, laced with numerology, sprawling with pitfalls, and coloured with controversy. Before going any further, I should make it clear that all sound is based on mathematical frequency. 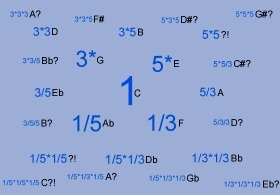 Whenever you hear a musical pitch, this can be represented by a number. For the purposes of this document, I am going to give a default value of 1 for the pitch of C. An octave above this (still C), would therefore be 2, and an octave above that would have a frequency of 4 (also, halving would produce lower octaves of C (i.e. 0.5, 0.25, 0.125 etc. etc.)). Another example is the Major 2nd (D for now - assume a tonic of C). The default value for D is approx. 1.1224 (200 cents). Suffice to say that the approximate values: 2.245 or 4.49 are still D, but octaves higher. Also 0.561 or 0.281 are still D, but octaves lower. Sound confusing? See the diagram below which should help to clarify things. The measurement is in 12-equal temperament and uses an accuracy of two decimal places for the frequency. All of the important pitches for one octave can be represented inside the values of 1 and 2 (making 12 pitches). Later on in this article, I'll be using the term 'normalise'. This simply means using multiples or divisions of two to change the original number to a fraction between 1 and 2 (e.g. if we wanted to normalise the number 7, we would half it until it was lower than 2 and higher than 1 (i.e. 7, then 3.5, then 1.75 (bingo))). To the ear, this is the same 'note' as 7, only a couple of octaves lower of course. Anyway, we all know what a major triad sounds like. It's that nice warm chord comprising the notes: C, E and G. But what is the exact frequency for the note E? Shown below are three possibilities. They're not just theoretical, as they've been used throughout history and are still sometimes used today, but does that make equally as valid? All of these pitches aren't chosen randomly, but come from various 'scale building' techniques of which I have described further below. As you can see, they are very close to each other, and also /sound/ very close, so it is very hard to tell which of these is the definitive E (Major third) that should make its way into every tune. Finally, there's also the possibility that these intervals are good in different ways. Actually, it's worth mentioning again that the pure third (1.25) clearly has a purpose in music, since it forms part of the harmonic series - and gives instruments their particular timbre. But in my opinion, timbre isn't necessarily related to melody or chords (the twelve intervals). 1.5 is three divided by two obviously. And 1.49831 seems an awkward number but is actually (27/12). By mathematical 'coincidence', these two are amazingly close. But which is the real (best sounding) perfect fourth? Or are they both melodically useful in different ways? Anyway, it turns out that there are nigh-on (but not quite) identical versions for each of the 12 pitches - depending on which formula you use to reach these numbers. At this point, you might want to try the survey at the end of this page, and come back here after you've heard what tuning you prefer. Where do all these numbers come from? All of these nearly identical versions are 'okay'. This is firstly because they're quite close to each other anyway, but also maybe because the brain has a certain amount of 'tolerance' and can get conditioned to slightly different pitches (if they're been heard enough times, it's possible the original pitches can then even sound off! [reference]). However, this doesn't mean that there isn't a perfect scale from which to deviate. Before you see the tables, I'll try to explain a little bit about each tuning. 2x/12 - where any note in the first octave can be produced by defining x from 0 to 12. For example, 24/12 (1.25992...) is closest to the Major Third or E (well... is the real Major third in my opinion) ...or try 29/12 (A or the Major 6th or 1.68179...)) etc. etc. All of the 12 notes and corresponding frequencies are shown in the colourful diagram over to the right (click the picture for a larger view). Well temperament 'Unfortunately', due to the nature of Just Intonation (JI) temperament, any piece of music would sound best played in one key - and without straying too far from this key (unless you want 'clashing' notes to creep in). Because of this, Just Intonation isn't a system well suited to traditional instruments which contain only fixed pitches (such as the keyboard or flute). Visit Wikipedia's definition for more information. and minor seventh - kinda 'grates' in my opinion), but on the whole, more complicated ratios will tend to produce more dissonant (even 'off-tune') intervals. This makes the system suspiciously arbitrary for melodical purposes in my opinion, and it turns out that many such calculations even produce similar numbers, causing debate over (for example) the best major 2nd or minor 7th in the tuning. It's important to say that 5-limit encompasses everything that the 3-limit system is - and more (see next paragraph). Lastly, there are internal inconsistencies (which I have detailed later on this page here) and practical problems too (see yellow box out for further info). Because of these reasons, most Just Intonation enthusiasts would instead use something like 1/4 or 1/6 comma meantone - which is sort of in between Just Intonation and Equal Temperament. For a more detailed description of 5-limit Just intonation, see here. A subset of 5-limit JI, this tuning was discovered by Pythagoras over 2500 years ago, and is often known as the 'circle of fifths' (diagram shown below). Instead of using the first three prime numbers (2, 3 and 5) as 5-limit does, it only uses the first two prime numbers - 2 and 3. Because of this, it is necessary to produce all of the important 12 pitches by multiplying the same numbers over and over again (example: the Minor 2nd (C#) is produced by calculating 3 to the power of 7 (that's 3 * 3 * 3 * 3 * 3 * 3 * 3) ). Compare this to 5-limit - which can get to a (nearly) identical pitch more quickly by using less multiplications or even single numbers. For example, to get closest to the major third in 5-limit, all you would need is the number 5 (normalise to 1.25 by dividing by 4 (2*2)). On the other hand, to get closest to the major third in 3-limit (maybe some would argue it is the real major third for some or all occasions - I certainly prefer it over that particular 5-limit version), you would need to calculate: 3*3*3*3 = 81 ( = 1.265625 when normalised to within 1 and 2 by constant halving). Just like 5-limit Just Intonation, there are practical problems if you try to play in a key other than the key that the instrument was tailored for. Because fixed pitch instruments such as the piano can only have a finite number of keys, it is impossible to obtain all of the pitches that the never-ending series in the scale produces. Technically, this is thanks to the twelfth fifth not intersecting with the octave, forming a discrepancy known as the "Pythagorean comma" - equal to 312/219, 1.0136..., or about 23.46 cents. Thus, instead of a neverending "line" or "spiral" of fifths, a fixed pitch instrument would use a truncated version - the "circle of fifths", perhaps by tuning six fifths up and five fifths down (creating C G D A E B F# forwards, and C F Bb Eb Ab Db backwards). With this arrangement, the interval between F# and Db is known as the 'wolf' note or interval, being slightly flatter than a true fifth (1.4798, or 678.49 cents wide). Suffice to say that other nearby intervals (such as Ab to B in this arrangement) also feel the knock-on effect. The 'better' intervals would be the ones which don't travel so far from the 'flat side' to the 'sharp side'. With non-fixed pitch instruments however, or dynamic 3-limit just intonation, the effect is lessened somewhat, since a true spiral of fifths can be obtained, allowing double flats and sharps if needed. Incidentally, if you were to have a theoretical 2-limit version of Just Intonation, the only pitches you'd be able to get for your scale - are pure octaves, since only multiplication or divisions of the number 2 would be allowed. Finally, I'll very briefly mention a few other Just Intonation variants. There's a more complicated 7-limit version of Just Intonation. This goes one further and now uses the prime numbers: 2, 3, 5 and 7. Naturally, it encompasses both 5-limit and 3-limit, so anything that can be produced in those can be done in 7-limit. The main reason for the use of 7-limit is to obtain ratios such as 7/6, 7/5, 7/4 etc. In my opinion though, these tones are slightly off-tune, and I don't think should be used as melodical fundamentals. However, don't get me wrong - I love pure intervals such as 7/4 when they're used properly as a direct relation to one of the twelve 12-eT fundamentals. In fact, it goes without saying that this interval is invariably present as the seventh harmonic in the timbre of many synth and orchestral instruments. In particular, bells tend to emphasize (make louder) intervals like 5/4, 7/4 and 11/8 (see later in this article for more information regarding the harmonic series). Also, there's a branch off Just Intonation called Meantone temperament. Similar to Well Temperament, each pitch is usually a 'fixed' compromise so that it can be used for traditional instruments such as the piano. The main aim is to attain 'pure' thirds (at the cost of the pure fifths) by pitching the 'whole tone' between the two most commonly used whole tone intervals from pure JI (10/9 & 9/8) - producing a pitch of 1.118. See Wikipedia's Meantone definition or Microtonal.co.uk or this page for more information. Just Intonation could be said to be in its purest form when each pitch and interval is tailored during the course of the music. This is called 'Dynamic' or 'Adaptive' Just Intonation. A computer is mostly necessary to handle this, though non fixed-pitched instruments (such as the human voice!) can handle the job with practise. Apart from the arguable sweetness of the JI intervals, you'll find that there are inherent problems with D-JI too. For example, you might find that the tonic changes throughout the tune, and by the time you've reached the end, the whole piece might have transposed by 1 or more semitones! Also, it is often mathematically impossible to keep certain chords and melodies internally consistent with each other. See this site for more information. "Pitch" is analogous to frequency or hertz. So for example, if C represents 1000 Hz, then E at Pitch 1.25 is basically 1000*1.25 = 1250 Hertz. (Concert pitch C is actually approximately 523.25 Hz. Relate all math to that). For "The Math" column in the "5-limit Just Intonation" and "Pythagoras Intonation" tables, you may need to constantly half or double the number to reach the pitch which is between 1 and 2 (normalizing). A "cent" is basically 1/100th of a semitone, so if you want to convert to semitones, just divide by 100. This scale is special because not only does it include every important pitch, but also there aren't any 'dud' notes generated. I think ultimately, that these are the only notes needed for all the best and most satisfying music (apart from for timbre purposes, or when a pitch 'slides', but this is usually done in-between beats, so it's more of an 'effect' than tonal deliberation). 'Just Intoned' pitches: There are many I haven't included in this table, but it includes all 12 notes and most of the simplest ratios. Ideally, the array of 5-limit JI intervals should be represented in two dimensions, rather than in a linear chain as shown above. See this picture for the full version. A lot of these notes sound quite reasonable, and of course they also have the alleged 'advantage' of being beat-less (that is, they don't have extra interference producing low frequency waves). But in my opinion, notes such as Eb, E, Ab, A and even F# are simply out of tune with the root, and should only be used for timbre in the form of the harmonic series. To convert from cents to interval ratio, use: 2 ^ (c / 1200), where c is the number of cents. A cent is 1/100th of a semitone. To convert from semitones to interval ratio, use: 2 ^ (c / 12), where c is the number of cents. To convert from interval ratio (analogous to hertz or frequency), to cents, use: 1200 * (log(i) / log(2)), or simply: 1200 * logBase2(i), where i is the interval. To convert from interval ratio, to semitones, use: 12 * (log(i) / log(2)), or simply: 12 * logBase2(i), where i is the interval. The general consensus is that the equal tempered 12 note scale has always been an admittedly good but imperfect 'compromise' when put up against 'Just interval', 'Well tempered', 'Mean-tone' or 'Pythagorean' tunings. Intervals defined by simple ratios (via 3 and 5-limit JI) are said to produce the 'sweetest' or 'purest' chords in music, but I don't think this is necessarily the case. If you haven't already guessed, I think the 'winner' is almost certainly 12-Tone Equal Temperament, with Pythagorean Intonation in a close second place. To my ear, Just Intonation (or meantone) melodies and chords sound slightly off. If you've read this far, you might well know that traditional Pythagorean notation will distinguish Eb and D# as slightly different pitches, but I think that for all intents and purposes, they are (or should be) the same note. Also, ratio defining pitches such as 3/2, 4/3 and 5/4 look mathematically neat, and are fine for timbre purposes, but I think that most likely, they are not appropriate for melody and chords in the traditional sense. So, my theory of the equal tempered 12 note scale being more inherently 'on tune' than other tunings is certainly controversial... and in fact I may even be wrong ;-) However, the philosophy behind the idea didn't just come to me overnight. Amongst other comparisons, I've spent hours trying to 'get used to' the tone of 1.25 (5/4) over 1.259 (24/12) against Root C by comparing them in a chord or melody. In my opinion, a major third tuned at the logarithmic pitch of ~1.2599 (12-eT) pitch was 'sweeter' and better. And that's not all... In the same way that the major third pitched at 5/4 is claimed to be the sweetest sounding third, the minor third (Eb) also happens to be pitched amazingly close to a particular Just interval ratio: 6/5 (1.2). This is also claimed by many as the ideal minor third, but in my opinion, it's surely too sharp to be considered the real McCoy, so once again the 12 equal version (23/12) or 1.1892 is the proper interval in my opinion. In fact, my opinion stretches across all 12 notes and their nearest JI equivalents. Let's dive into some theory... There are supposedly two main 'reasons' why 12-eT is considered a 'compromise' - which I'll explain now. 1: Splitting the atom: Just like in physics, when you zoom down to the atomic level of music, unexpected things start to happen, and things go crazy :-) This section assumes some level of acoustical knowledge upon the reader, but I'll try to make it as readable as possible. Firstly, it is true, that 12-eT has 'problems' due to inherent complexities such as harmonic partial clashing, and periodic 'beating' - which produces extra unwanted tones. Although these make the 12-eT scale seemingly 'imperfect' (and therefore music itself - or at least the transmission mechanism of sound and what our brain does with it), the truth is that Just Intonation, Meantone and every other type of chromatic scale has these exact problems too. Harmonic series/overtones/partials are the natural 'building blocks' for an instrument's timbre. One could write tons of stuff on this, but I'll keep it short for the purposes of this article. You might want to download this sound which will help you to visualize what I'm talking about. The red numbers below-left refer to the frequency of pitch. The number after the 3 arrows signify the pitch after normalization). Amazingly, all of these tones mixed together aren't really heard as 'separate' pitches. Instead, they camouflage into the fundamental (1st harmonic) to produce a unique timbre or 'texture' for the instrument. Hard to believe I know, but true. For example, a saxophone will have many such harmonics. A flute on the other hand will generally only have one or two harmonics - something closer to a pure sine wave. Also, a trumpet may have the first few harmonics emphasized. Generally, the more harmonic partials an instrument has, the 'sharper' or 'brighter' the resulting sound will be. Also, you can even alter the relative volumes of each harmonic - making the overall sound sharper in 'different' ways - and they'll still camouflage with the fundamental harmonic to produce 'one' sound. Harmonic one = the fundamental. Harmonic 2 = overtone 1. Harmonic 3 = overtone 2. Harmonic 4 = overtone 3 etc. etc. etc. If you don't fully understand, hear that sound you downloaded. At first, you'll hear a pure sine wave, followed by more and more harmonics coming in. You'll hear how these extra tones aren't perceived as 'separate' melodic pitches, but rather as 'complementing' the first harmonic. It will sound a bit like "ooooooooo ... alllllllll ... arrrrrrrr ... aaaaaaaa ... iiiiiiiiii". By the way, I've tried changing the exact frequencies of the harmonics slightly, and (just as I thought), the further you get from these exact harmonic multiples, the less they camouflage with the fundamental, and instead sound like a 'bunch' of separate pitches. So, going back to the original point, why is all this a problem? How does this make 12-eT a 'compromise'? Well, simply put, these harmonics are in one sense also 'unwanted' pitches. It's a paradox I know - you want them for all the unique and different timbres, but you don't want them for the 'melodic' relationships. Thankfully, because these harmonic overtones merge in so well with the fundamental harmonic (intended pitch), you barely notice their 'melodious' property. But nevertheless, they're still there, no matter how faint they are. If you play a (JI) C minor chord, the 5th harmonic of C (E) would very slightly clash with the Eb note in the C minor chord, just like it does with 12-eT. Also try this. Take the 5th harmonic of E in a C major chord. This is certainly an 'unwanted' pitch - somewhere in between G and G# (at 772.3 cents, it's closer to G#). Both JI and 12-eT have this exact 'problem'. Another thing worth pointing out is how frequencies such as 5/3 are technically 5-limit JI intervals, but as far as the harmonic series is concerned, they're not directly related to the fundamental harmonic - only as a relation between the 3rd and 5th harmonic. In other words, if you take the partial 5/3 = 1.6666, this will support /another/ fundamental (that of the pitch 0.3333, or the subdominant note about two and a half octaves below the original fundamental). Summary: All chromatic scale tunings have this 'problem' or 'idiosyncrasy', and so strictly speaking, literally hundreds (or even thousands) of harmonic partials are simultaneously 'clashing' with other fundamentals and their countless harmonics in a piece of music. This is just one reason I believe timbre and harmony should be separated, and that the harmonic series is not directly related to the 'sweetness' of the 12 fundamental intervals. Virtual Pitch: Directly related to the concept of the harmonic series, 'virtual pitch' is the phenomenon you get when two upper harmonics combine to seemingly produce a third, lower, fundamental pitch. This new 'phantom' pitch doesn't really exist, but somehow the mind interprets it as an actual sound. For example, if you play the note C and its JI minor third (Eb), you 'unfortunately' also 'hear' an 'unwanted' pitch of G# two octaves lower in the bass. Likewise, if you play C and G together, you get lower C in the bass (one octave down from the original C this time). It's very quiet which is why you don't usually notice it, but nevertheless it's there, and you can't get rid of it :) This problem occurs with all tunings (12-eT, JI, meantone etc. ), though I'll 'admit' that Just Intonation 'reduces' the problem in some cases, due to the fact that this extra unwanted tone can often be in harmony with the chord (such as the case with C and G mentioned earlier), but nevertheless, it's still an unwanted note that 'shouldn't' be there. I quote 'shouldn't' because without this 'unwanted' pitch, the whole concept of the harmonic series and timbre would also vanish! Summary: I'll finish off by saying that this phenomenon is barely audible in practise, and I certainly don't think it can really be used as proof to argue the superiority of Just Intonation over 12-eT in regards to the 'sweetness' (read 'on-tuneness') of the intended interval or chord. To calculate the frequency of the extra 'unwanted' tone, you generally find the highest common factor of the two pitches in the chord (i.e. 1 & 1.2 produce a highest common factor of 0.2 (or 1.6 when normalized)). See here for more information about virtual or 'subjective' pitch. Above, I've discussed how the tunings compare when you go down to the basics of sound. I've demonstrated that in some cases, Just Intonation appears to have slight 'advantages' when it comes to harmony at the timbral level. However, this is often taken by many to signify that the JI fundamentals themselves are aesthetically 'on-tune' with each other. Of course, in reality, there's no way to know for sure, apart from an ear test - and even then, that will be subjective, and hard to tell since they're so close in frequency. So why then do many music theorists think that the equal tempered scale is a compromise? b: ..And that these irrational numbers will produce intervals containing first and second order 'beats' (these are heard as a 'tremolo' effect, and are more subtle with second order beats than first order). For most or all intents and purposes, these 'beats' aren't a problem, and once again, I doubt it can be used as 'evidence' that the 12-equal fundamentals are less 'sweet' than the JI fundamentals. These 'beats' only become a real problem when they are exacerbated by certain instruments such as the harmonica and pipe organ (see g). Also, the lack of 'beats', and periodical pattern of coinciding wavelengths both imply that two tones would need to be played simultaneously (i.e. as a dyad) for the perceptual feeling of harmony. However, as we all know, even if these intervals are played linearly (as a melody, or broken chord), the feeling of the interval is still omnipresent. This is despite the fact that no periodical pattern, or any form of timbre interaction of the two tones is taking place. See here for more info on first and second order beating/consonance. c: Singers tend to sing the pure/just ratios when they can. Well, I have sometimes heard the reverse too, and how even without instrumentation, professional singers will (naturally) sing the 12-eT pitches. See this site for more details. Finally, it is perfectly possible that singers deliberately hit the 'pure' ratios purely for timbre purposes so as to 'thicken' the timbre of a lower note (I don't have a problem with that - as long as another singer's corresponding 'fundamental' pitch is exactly 12-eT). d: Some people simply prefer the Well/Mean/Just temperaments in music for whatever reasons. There could be a number of reasons for this. Perhaps JI adherents are 'wrong' to prefer it, (unless I'm wrong to prefer 12-equal of which I admit there's a chance). Alternatively, perhaps both are 'valid' tunings, though I somewhat doubt this scenario, unless we're really hearing the same thing in the mind's eye. See here for more info. e: "But equal temperament just sounds wrong to me!" But is it really ET though? It is well known that certain string instruments such as the piano have timbres which consist of increasingly sharpened (higher pitched) partials. In other words, if you play a low A on the piano, each successive overtone will be (very slightly) more and more sharp from the natural harmonic. Naturally, these inharmonic partials will form a tone which is perceptively sharper than the actual fundamental would suggest. Because of this, it is best to 'stretch' the octaves very slightly by tuning each note a little sharper than it would otherwise be. This same phenomenon applies to other string instruments such as the guitar and mandolin. See this site or this site for more info. f: Slightly detuned scales are appropriate to allow for 'key colour' so that each key has a different 'character', 'atmosphere' or 'flavour'. This may be the case (even if only to a limited extent). But the point still stands - the 12-eT scale is the original 'blue-print' from which to deviate. g: Some instruments might/do sound better in Just Intonation - possibly due to complex vibrations reverberating inside the instrument? Instruments such as the harmonica and pipe organ suffer from this problem, and in fact, even I prefer these instruments to be tuned to Just Intonation or Well temperament. But of course, this isn't anything wrong with Equal Temperament, and if each note was separately sampled in to a computer and then manually mixed, it would then sound okay. It's sometimes said how instruments such as the harpsichord sound better tuned to Just Intonation. Could this also be caused by the aforementioned reverberation? This above issue intrigued me. Does the harpsichord really sound better tuned to Just Intonation - and if it does, in what way does it sound better? This following Youtube video created by Bradley Lehman may shed some light on the issue. I have put the SAME VIDEO side by side, so you can compare the differences more easily. Start the left at 0:06 seconds, and start the right version at 1:19 seconds. Play a bit of the "equal tempered" left one (say 5-10 secs), then stop it. Then play the "Well tempered" right version for the same number of seconds, and then stop that. Keep doing this so you get a feel for how they are different. Also do the same process for the C-major prelude of the Well Tempered Clavier at 2:35 (equal temperament) on the left, and 4:42 (well temperament) on the right. After listening myself, I do indeed find that Well tempered version sounds 'smoother' albeit very slightly less 'on tune'. It is smoother in the sense that some of the notes in the equal tempered version are disproportionately louder than others, Whilst the well tempered version has a more consistent volume. However, I believe this is largely down to the complex acoustical interference of the instrument rather than any problem inherent in equal temperament. Visit the Youtube page of this video to read other comments on this video including the author's. I also composed a short piece to specially compare equal temperament with the less subtle Just intonation tuning (the above videos used Well temperament, which is a compromise between ET and JI, and therefore it was more subtle). It uses a synthetic harpsichord style instrument with lots of upper harmonics. For a fair comparison, I tailored the piece to stick mostly to the key of C. See which one you prefer! (both files are just 254 k each). As expected, I found the 12-eT version definitely to sound more on tune, which would indicate that along with the harmonic series, the 12 equal 'tempered' notes /do/ seem to represent an ideal. There was nothing that was really better about the JI version. It just sounded a little more 'jangly', with maybe a few notes quieter than 12et - and that was it. Curiously, even a lot of sites mostly dedicated to standard music theory (12-equal based) seem to 'concede' that 12-eT is a 'necessary compromise' born out of convenience due to the practical difficulties of Just Intonation. This is often said as though they were 'taught' this for historical reasons, rather than an objective comparison via a listening test (though I suppose this isn't always the case). Of course, in my opinion, I think the practicality aspect is simply a bonus on top. 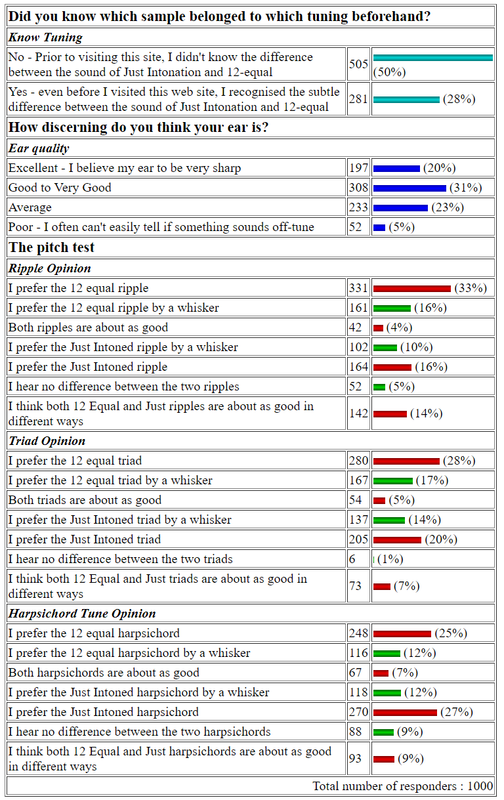 Judging from the results so far, 12-eT is ahead in two of the three experiments (chord, ripple and tune). Make sure you cast your vote. Mathematically, I suppose the biggest 'evidence' I can claim against the validity of Just intonation is the way it's so internally inconsistent. Melody is often at odds with harmony - even in Dynamic JI. Also, it can produce an 'infinite' number of pitches - thus causing debate over whether (for example) the real Major 3rd is taken from 3-limit JI (81/64 or perhaps 8192/6561), or 5-limit JI (5/4). Likewise, it's arguable whether the Minor Seventh is represented in 7-limit or 5-limit or 3-limit. Also, where does one draw the line? You could easily draw upon multitudes of new pitches using ever higher limits (11-limit, 13-limit, 17-limit...). The harmonic series goes on 'forever' too, but at least they all merge with the fundamental to form a proper timbre. Before I continue with this section, I'd like to say that used properly in the timbral context, emphasizing frequencies such as 5/4, 7/4 & 11/8 really can sound great in music. If I had to describe the effect of the ratio 7/4, I'd say it has an 'eerie', 'mechanical' or 'droning' almost bell-style sound to it. In fact I made a short mp3 to demonstrate these exotic pitches, and how good they can sound. You can download and listen to it here. B: ...Possibly only a fundamental that is desired for that particular chord in the tune (and going even further - maybe even just the tonal key or bass/root of that chord). The first of these reasons - is to form a tuning scale with pitches close to the Just Intervals (more notes in the scale will be more likely to do this, especially if the piece is modulating to other keys). It turns out that some of the best equal tempered scales to accomplish this use 19, 31 or 72 notes per octave. In fact, its goal is similar to Well or Meantone temperament and just like those, it's now possible to change key much more easily without any clashes. On the downside, it's not so easy to learn due to the many notes, so not really very practical for many people. In essence, I suppose one could call these scales Chromatic, because on the whole, only the 12 notes are actually used (the ones closest to the supposedly 'ideal' Just Intervals). In a given key, all of the rest are mostly scrapped - with the exception of using them for timbral purposes (like 7/4). To sum up my views on this system... As you might guess, it is my opinion there's a chance that the original ratio pitches (or 'Just intervals') are ultimately flawed for the chromatic fundamentals, so I think it may be a false objective to try and get close to them. However, there is the slight advantage that you can use some of these notes to build a 'new timbre' when combined with the fundamental or lower overtones. The second reason for using more than 12 notes is an attempt to use all of these notes in a 'type' of music called 'Microtonal' or 'Xenharmonic' music (nb: the exact definition of 'Microtonal' is still debated, and it can confusingly also refer to the first reason). Once again, any number of notes can be chosen - 10, 13, 19, 31, 43 etc. etc. (you name it) are used per octave, but unlike the first reason mentioned in the previous paragraph, most or all of the notes are used. These unorthodox scales used in Xenharmonic music sound very strange to most people (at least in the Western hemisphere), but there are quite a few people who compose music like this. I guess many supporters of this style of microtonal music would argue that it's only because of 'cultural conditioning' that music with more than 12 (equally spaced) notes sounds so strange to the majority of people. Well... I asked this very question at the eGroups Tuning Forum. I simply asked if there were any tunes on the web to compare 12 eT against various Just/Mean temperaments. There was a response - yay! :-) This took me to the page located at http://bellsouthpwp.net/j/d/jdelaub/jstudio.htm. This looks very interesting. There are tunes comparing stuff like Chopin's "Fantaisie Impromptu" and Gershwin's "Rhapsody in Blue" in various temperaments. I'm going to dedicate myself now to hearing a certain kind of adaptive Meantone temperament called 5-limit adaptive tuning. It aims to keep as close as possible to 'perfect' Just tuning - while also allowing for flexible melodic 'jumping'. As expected, I found it 'off-tune' at first (chords also have a slightly 'metallic' timbre - thanks to the Just intervals), but what I plan to do is hear this (and only this) 'initially alien' tuning for the next few days/weeks - and see if I can really get to prefer it. I somehow still suspect that I won't, but I'm going to keep an open mind about this - since obviously quite a few people seem to think otherwise. I'll be posting the results here in a few days/weeks time. Well I tried. I really did. For more than a week, I've heard the same tunes with as little 'exposure' to 12-eT as possible (quite hard in this day and age one might find ;-). Almost like a diet really, but at least the tunes were quite good to begin with! And the outcome: Well, to be honest, I can't really say I like the new temperament any more than I did to begin with. Maybe if I stuck at it longer, I'd eventually get used to it a bit more, but whether I would (or even should) is doubtful in my opinion. I haven't 'given up' though. After a request from the Tuning group, I'm going to learn more about something to do with 'combinational tones', and try out even /more/ music in Mean temperament (slightly different to "5-limit adaptive" tuning - although its ultimate aim (i.e. getting close to JI chords) appears to be similar). I've also recently been having flame wars with the tuning group again ;-) (that's a joke, they're quite friendly!). At least one person in the group has always preferred Mean/Just intonation, even after getting used to the same tune/s in 12-eT initially! This means my earlier claim on this page about a tolerance level (i.e. getting 'used' to a new tuning) would seem to be at least partially wrong (or at least not the whole truth). a: A 'false' preference to JI might be due to a timbre phenomenon with traditional instruments - such as the harmonic partials clashing with the fundamental tones and/or each other (which could be rectified if an instruments' tones /and/ overtones were tuned to 12-eT (probably need a synthesizer to do that though ;-). b: Either I am 'wrong' to prefer music in 12-eT, or he is 'wrong' not to. c: Unlikely, but there might be an interesting 'pseudo' mathematical effect with sounds exclusive to Meantone/JI tuning. I haven't particularly 'noticed' this, but if true, this would mean both tunings have fundamental advantages and disadvantages. d: Also unlikely, but maybe some people hear tones differently from others. However, this is almost like saying some people see the colour brown as blue ;-) I certainly haven't dismissed this notion though, as the ear itself is a very complex piece of hardware. I was again trying to 'get used to' the sound of various Just Intonation temperaments over 12-eT - without success. I guess the reason I'm still trying at all - is the way that simple JI ratios (such as 3/2 and 4/3) form the basis for most instrument harmonics (orchestral or synthesizer timbres). These will then (very, very slightly) clash with any 12-equal pitches. As I have said earlier on, you could tune all harmonics to 12-equal partials, but perhaps one would miss out on the 'different' instrument timbres that the natural harmonics of JI produces. 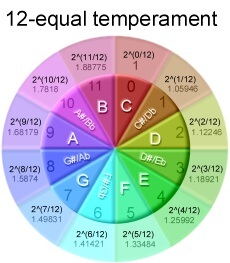 Actually, I did some further research, and as far as I know, this is the only site on the whole net that argues the theory that the 12 equal temperament might not be a compromise in any way. This came as a real surprise to me - considering the dominating use of 12-equal for most of the world's music. In email exchanges with people, a few have agreed with me how there might be a chance that 12-eT isn't a compromise, but I really expected a few such pages on the web too. If there is one thing I have noticed about the sound of JI (apart from it sounding off tune), I would say it has a more 'metallic' sound than 12-equal. This will in turn give the timbre a distinctive flavour, but that still doesn't get away from the fact that it also sounds off to me. From what I've heard, JI advocates tend to look at 12-eT as 'plain', 'bland' or 'colourless', (though I guess they find 12-eT simply off-tune too). I would love to hear some opinions about this. If you prefer JI over 12-eT, why do you prefer it? Does 12-eT sound boring in comparison, or does it sound 'off-tune' as well? I've been experimenting with harmonics on my computer more thoroughly lately, and have confirmed to myself that hundreds and thousands of partials (in both 12-eT and Just Intonation) unavoidably clash very slightly with the fundamental tones from other notes present in the music. And so I tried (in vain) to look for a way around it. The first thing I tried was to alter the (usually) harmonic partials to unorthodox 12-eT partials and 'mold' them with the accompanying chord (even if it meant limiting the number of partials and/or raising or dropping a certain partial by a semi-tone or two). But all too often, doing this will make the partials sound like an extra 'layer' of melody, as opposed to 'thickening' and 'camouflaging' with the fundamental harmonic to produce a unique timbre. In other words, it doesn't sound like a single instrument anymore - more like a bunch of sine wave pitches. Even ignoring this problem, if the 'partial molding' is happening throughout the music, then you'll never get a instrument with a constant timbre, but instead get a constantly 'evolving' timbre (not that that would necessarily be a bad thing, but it's nice to have the choice!). Similar to the above, I didn't remove or drastically change any partials, but instead altered the partials (overtones) to their nearest 12-eT equivalents (so instead of 1, 2, 3, 4, 5 etc., you get overtones of 1, 2, 2.9966, 4, 5.0396 etc.). Apart from being mathematically inelegant though, there's the problem I've mentioned in the previous paragraph - 'whole' numbers work better to form a proper timbre - while 12-eT partials are closer to forming 'separate' notes. Somehow, the whole number overtones 'camouflage' in with the timbre better to make a 'new' instrument. Of course, music based around a Just Intonation tuning scale would be a compromise for similar reasons. For example, if you play a C minor chord, the 5th harmonic (E) would very slightly clash with the Eb note in the C minor chord. It would be mostly inaudible, but nevertheless there. So, perhaps the right thing to say is that /all/ scales and tunings have this 'problem' or 'compromise', in that the harmonic series behind the timbre will most likely clash with the fundamental notes in certain chords. (Note - this is a different kind of 'compromise' that I am using as the main argument for this site). To sum up, complex timbres (trumpet, piano, violin - most any instrument you could name) will introduce extra tones - from a single note - that may not be desired for melodical reasons. Just as well they camouflage so well though. Remember that 'virtual pitch' phenomenon I mentioned earlier? Well I tried something to get rid of that extra 'unwanted' tone. It involved playing C in the left ear, and Eb in the right ear. Interestingly, the 'problem' still occurred - I still heard a faint G# (hmm... perhaps /slightly/ quieter), which signifies to me that it's not the ear mechanism at 'fault' in particular, but rather the brain's innate response. I remembered my experiment I created some time ago which first convinced me about 12-eT. For people who prefer the pitch 1.25 for the major third, then 1.25992 should sound as 'off-tune' as the 'inverse' of 1.25 - which is 1.24016 (logarithmically, 1.24016 to 1.25, is what 1.25 is to 1.25992). (with the perfect fifth, I did the equivalent 'inverse' thing). Now in my opinion, the 1st one sounds /miles/ better, but to people who think the Just Intonation Major triad is 'sweetest', then theoretically, they would expect both of the above two triads to sound /equally as bad/ or 'off-tune'. But to be honest, I think practically everyone would prefer the first one. Now this is fairly conclusive for me, but I also considered how the subtle secondary and tertiary 'beating' might be different for 1.24016 than 1.25992. But then I tried the test with /broken/ chords (i.e. as a melody - C E G E C E G). This way, beating is taken out of the equation. As you might imagine, the 12-eT third was again - a lot better than the 'inversed' third. Secondly, could the perfect fifth be complicating matters? Maybe if I just played C and E, there would be some kind of difference...? Nope, the results from the two-tone diad was no different from the triad. "Moreover, professional musicians appear to prefer equally tempered intervals to their just counterparts". www.cini.ve.cnr.it/isma2001/Parncutt_ISMA2001.pdf - Critical comparison of acoustical and perceptual theories of the origin of musical scales. I've been researching 'World Music' lately. It turns out that practically all cultures (even remote island tribes who have had no previous contact with the rest of the world) have some form of scale based on the 12 note chromatic scale (often the diatonic or pentatonic subset). Yes, there are occasionally cultures that base their scale on something like say... 7-eT (Siamese), or on 5 notes (Gamelan) or even a 'quarter-tone' Indian scale*, but either the music is monophonic in nature, and/or it relies on unusual instrument timbres to create an atonal-esque 'textural' sound, rather than harmonious melodies, chord patterns and structures with a proper tonal key. You'll also find cultures where people don't have one 'standard' scale system, and instead pick notes seemingly at random, with no relation to any equal tempered system (5, 12, 19 etc.) /or/ pure ratios. Again, this type of music is either fully or at least to some extent 'pseudo-atonal', where the emphasis is on the 'texture'. That's not to say that music using such scales is invalid, but I believe it's certainly missing the important 'chromatic' dimension. The best music combines both aspects. * It's worth mentioning that although there are technically 22 notes in the traditional Indian octave, some musicologists have found that practically all of these approximate to the 12 standard semitones. In my opinion, the subtle 'quartertone' differences are used as 'interpolating' notes - perhaps used as 'ornaments', or in place of a slide. It's true that 'inflexions' (gamakas) are outside the normal 12-et range, but according to the graphs in the paper below these are fleeting, and are not time-steady pitches (despite characterizing the works to a large degree). 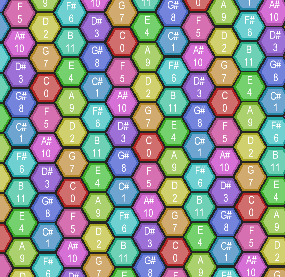 It turns out that the 12 note system can be represented quite nicely using a honeycomb or hexagonal lattice. Here's how to build one from scratch. First off, here are the twelve notes we'll be using. I've assigned each note a tertiary colour based on the scale of fifths (see right diagram). Okay, first we start off with the major triad, one of the basic chords in the chromatic scale (see diagram to the left). But how about the minor triad? Well, we can add the minor third (D#) to the left (see right diagram). There are six major/minor chords that contain the note C in them (C major, C minor, A minor, G# Major, F minor and F major). 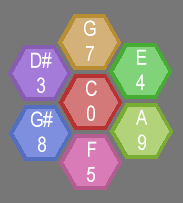 Now we can surround the hexagon with 3 other notes - making the shape you can see on the left. Can we build out further than this? It turns out we can. In this next example, I've added the notes B and C# at the upper right region. Once again, these notes are 'forced', and intriguingly, the whole pattern interrelates perfectly. 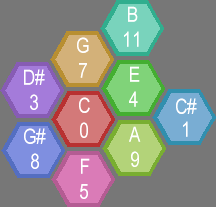 We can build indefinitely, and any 'triangle' of hexagons you care to pick will be a major or a minor chord. Furthermore, all twelve notes are used. Click here for a larger view of the below diagram. I tried to look for further patterns. Maybe something interesting happens with the diatonic scale? Well, sort of; it turns out that each diatonic tone is always a 'leap' away (so the C hexagon is never touching the D hexagon, and the D is not in contact with E etc. etc.). Is this honeycomb system unique to the 12 note scale? Unfortunately, not really as far as I know, as a similar pattern can be achieved with 16 notes and beyond. See this page for a 16 note lattice. An update at last! It's been over 3 years! I'm going to spend more time researching this, especially since I'm using this topic for my dissertation at university. First off, here's a new page with lots of listening tests based on the Major 3rd. 1: They literally hear the interval differently. For example, someone who hears an interval of 390 cents could hear it as 400 cents (or vice versa). 2: They hear the same 'pitch height difference', so in one sense, they are still hearing a '390 cents' interval. However, if we assume that the brain abstractly maps to 12 intervals, and that these intervals are being represented by different neuron clusters in the brain, then it may be the case that they are receiving no minor 3rd neuron pollution, and only major third neurons are being excited. This is in contrast to people like myself, where the 390 cents interval would excite not many, but a few neurons for the minor third as well as the major third, and thus cause interval ambiguity. In both of the cases above, the timbre (or feeling of the beats created by an interval) would remain the same for all people. However, I count this is a separate type of consonance to the consonance type created by the 12 intervals. Just for the record, that doesn't necessarily mean there's something special about the number 1.25992 (24/12) for the major third. The thing that's special is the Major third *sensation* in the mind's eye. It's just that different people would need different input from the outside world to activate this interval as sweetly as possible. Having read a lot of material on pyschoacoustics, and discovered the difference between first and second order beats, the one factor I think is taken is overlooked in most experiments on intonation comparison in general (including on this site - will fix soon) is how certain partials will create the all-important first order beats with other partials from a different pitch in the same chord. This can more easily influence the perception of an interval if the listener is not careful. Major third in Just intonation (f1 and f1.25) - first 5 harmonics. Major third in Equal temperament (f1 and f1.25992) - first 5 harmonics. As you can hear, compared to the JI version, the equal tempered version has a slight tremelo effect (quiet-loud-quiet-loud). Major third in just intonation (f1 and f1.25) - first 5 harmonics, excluding 4th harmonic in major third. Major third in equal temperament (f1 and f1.25992) - first 5 harmonics, excluding 4th harmonic in major third. As you can hear, these two sound much more similar to each other than before! Therefore, it should be much easier to compare the raw pitch of the two diads if we exclude the 4th harmonic of the M3rd in this way. I prefer the ET major third in one way (melodically, tonally, more major-3rd-ally), but it goes without saying that the Just third sounds more like a fused sound (therefore being more consonant in another way). These two major types of consonance form my 'own' theory, and I really think it could be true. See January 2007 to see how the first consonance type could vary from person to person though. I've now updated this whole page to take into account some of the information present in my dissertation, along with links throughout. Although there are few references on this page, my dissertation has almost 200 of them, so visit there if you need sources, quotes, and verification. This addresses Argument 3 stated near the beginning of the dissertation. Despite the idea that two different physical intervals could sound the same to the mind's eye for two different people, there's still the chance that one tuning may be easier to get used to, and perhaps therefore in a sense provides the 'truer' intervals for chromatic consonance. An analogy could be likened to riding a bike with the handle bars turned by 30 degrees. Over time, the mind compensates, and then returning to 'normal' positioning of the handle bars would feel strange (for a short while). However, riding a bike with the handle bars twisted by 30 degrees may include costs, such as taking longer to get used to, and may ultimately provide slightly less accurate control of the bike. As an extreme example, one may try to recondition oneself to prefer the perfect fifth at 40 cents flatter than the ET or JI tuned fifth. As one might imagine, this would take a long time to condition anyone to! It therefore follows that even if it's by fractional amounts, perhaps the just intoned interval is quicker to condition people to than the other models on average. Or maybe it's the ET or Pythagorean models that would work out quicker - who knows. In summary, there may still be ideal pitch values for the twelve intervals, whether they are JI, ET, Pythagorean or whatever else. Added video comparison created by Bradley Lehman to this page. I prefer the Well tempered version, but this isn't equal temperament's fault, but rather how the harpsichord treats equal temperament. 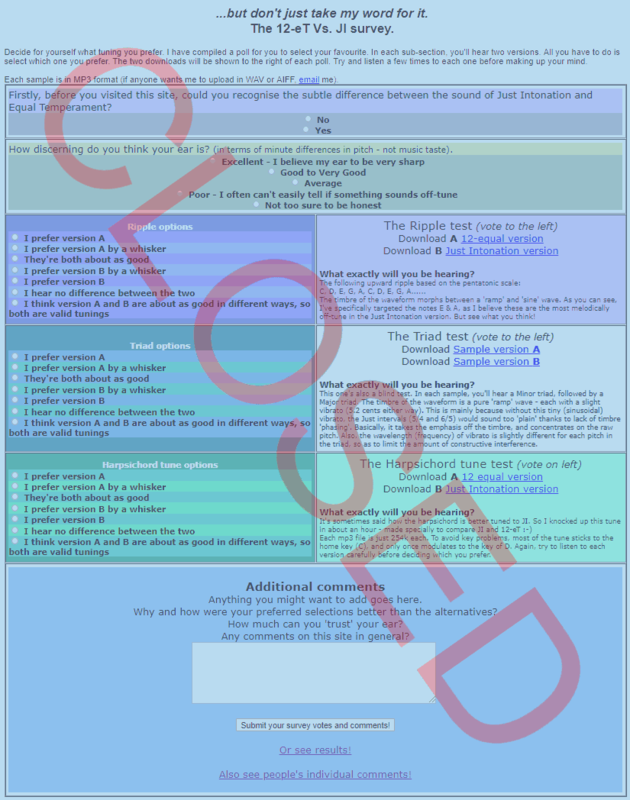 After a long hiatus, I revisited this page, mostly to tie up loose ends with the survey. Wow it has been a while. Thank you to everyone for all your comments, thoughts, insights (and even the occasional insult, though most have been positive!). Looks like Equal Temperament won out overall, though Just Intonation won by a whisker for the harpsichord tune which I thought was a bit odd, but there we go. If I were to redo the poll, I might make all three blind tests, instead of just one of them. Using more real-sounding instruments would also be an idea, though in some ways, it is easier to distinguish between tunings if there are harsher synthetic instruments that have a greater number of harmonics. Just read the whole of this site again too. It was kinda fun. I still don't think we're much closer to solving the mystery of the twelve notes though! Update 2019-04: Thank you to everyone who took part in this survey over the years! There were around 900-1500 submissions in total. I have closed it now, but obviously I am going to keep open the results. Note that there has been no censorship of the data; all of the comments and occasional insults (!) are raw and uncut. Thankfully it looks like duplicate submissions, spam, and non-responses have been kept to a minimum. In case the poll software has miscounted in some instances, it may be worth poring through the log manually to obtain more accuracy and to make sure totals are consistent. I may attempt this at some point in the future. Alternatively, Click here to see everyone's individual responses, including comments, insights, praise, and rare insults! The "Warped Canon" Page - Contains 'Pachelbel's Canon' in many different tunings (midi format). Scientific American - Exploring the Musical Brain - A look at how certain animals (such as the humpback whale, canyon wren and wood thrush) base their 'song' on the diatonic and chromatic scale. Music of Sacred Temperament - So far, about the only site I've seen that also favours 12-eT as some kind of ideal. Site is also dedicated to the works of Bach. The dissonant tritone and Just Tuning theory - Examples of how the Just intonation ratios can be 'rigged' to justify preconceptions of consonance. Combinational Music Theory - Excellent paper by Andrew Duncan, explaining some very interesting patterns in the diatonic and pentatonic scales. Bach's understanding of key character - The first part of this open debate spoke about the virtues of meantone and whether enharmonic notes (such as Ab and G#) should really be different. The second half argues whether Bach intended equal temperament or well temperament for his "Well-tempered Clavier". The Elements of Acoustics and Psychoacoustics - Information on the objective and subjective response to loudness and pitch. Pitch shifts and pitch deviations - Explains how subjective pitch is not entirely independent from timbre, intensity etc. - due to slight errors in the ear/brain system. http://www.casaninja.com/christi/academic/classicaltuning.html - Detailing some of the convoluted and messy history behind tuning. Tuning for Beginners - Contains an introduction to Microtonal tuning. Well vs. equal temperament - A controversial thesis arguing how the Well-tempered Clavier by Bach wasn't intended to demonstrate 12-Equal temperament - and that 12-eT only came into use in the 20th century. Wikipedia.org - Musical_tuning - Information and links relating to tuning in general. Tonotopic Interference - An interesting theory of consonance. http://www.justonic.com - More about Just Intonation. Brian McLaren - Lots of interesting and controversial posts on microtonality from Brian McLaren (taken from the tuning forum at Mill College). The Creation of Musical Scales, part II - A look into the history of world tunings by Thomas Hightower. Site explores both Eastern and Western music scales. Just Intonation vs. Equal Temperament - A video showing the apparent superiority of JI. I disagree fully due to the reasons given on this page, but it's a good comparison none-the-less. Visit the Soundburst Shrine for some intricate and catchy music! Also visit the Aesthetics of music page to see if music can be rated outside of human opinion. All text on this page is copyright D. White 2002 onwards.